Thank you for visiting the Mihoko Goto Homepage. in St. Petersburg on the 26th Oct 2018. Mihoko has its own radio program. 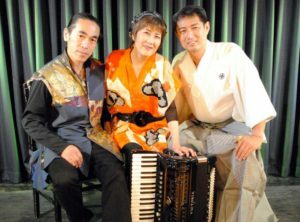 Mihoko Goto is one of the leading accordionists in Japan, whose unique sound and performing style is highly praised both at home and abroad. Mihoko started playing the piano at the age of five, and at age ten, she took up the accordion. After graduating from Osaka College of Music, majoring in piano, she began her music teaching career at an elementary school while continuing her studies in contemporary music. Twelve years later, she left her teaching career and visited U.K. and Hong Kong for further musical education. 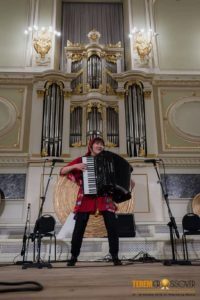 Collaboration with composers and accordionists of U.K. and Hong Kong inspired her to embark on her career as an accordionist back in Japan. Mihoko was fortunate to have additional chance to study accordion abroad. She received guidance from Nick Ariondo of Los Angeles in 1997, and later in 1999, coaching from Viacheslav Semionov in Moscow Russia. In 2001, she held her first major recital in Osaka. 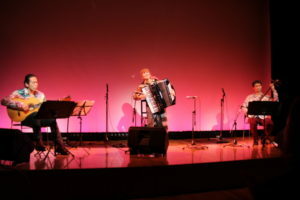 From 2002 to 2004, after moving to Tokyo, her main musical career as an accordionist was with “TENGO”, a Roma music unit. Together they appeared on TV and radio, held concerts around the country while releasing three albums consecutively from Victor Entertainment, Inc. In 2003, they served as a friendship and exchange artist for Russia’s St.Petersburg 300th anniversary city founding event. Mihoko released her solo album “accordionist” in 2010, five years after started playing solo. She performed as an accordionist in Broadway shows in NYC in2013. She also performed in Germany and Russia in 2014 and 2015. She participated in the Kaustinen Folk Music Festival from 2016 to 2018. Mihoko is actively touring all over Japan yearly. She is an artist with inclination towards classical and east European and Roma music. At the same time, she adheres to and cherishes her own identity, which brings her affection and appreciation towards Japanese music. Audience will be intrigued by Mihoko’s presentation of accordion music – a new genre of collaboration of Japanese and European music on a traditional European instrument. Performing “Senbon-zakura”(means 1000 cherry blossoms, arranged by Mihoko Goto) in Kaustinen Folk Music Festival in Finland. HIBIKI is Japanese which means “resonance” in English. We have a large repertoire such as Japanese traditional music, classical music, flamenco, rock, Russian music, world music, and so on. We live in Tokyo. We’ve all played many concerts all over Japan for 10 years. Performed at BX hall in Bunka Shutter Co.,Ltd.in Tokyo on the 27th. of Apr. 2018. Mihoko Goto arranged “Toccata” by Bach, and composed ” Pegasus”. Performed at BX hall in Bunka Shutter Co.,Ltd.in Tokyo on the 27th. of Apr. 2018. Mihoko Goto arranged “Wearied Sun ” which is a Russian old tango. If you’re planning a party or a corporate event, I would be more than happy to put together a good show for you. Contact me by email on the link below.